Taking a Stand on Venezuela and Nicaragua. Left Should Stand with our Sisters and Brothers. Reuters today reports, The Venezuelan regime is gearing up to the end game: Maduro says Venezuela’s civil militia grows to 1.6 million members. The economy is shrinking but the country has so far refused to produce economic data on gross domestic product or inflation despite repeated requests and potentially a major default on Venezuela’s sovereign debt. The country’s inability to pay bondholders could lead to it losing over the next few months of one its main assets — the international trading company Citgo. What should be one of the richest countries in Latin America, given its extensive oil and mineral resources from gold to bauxite and diamonds, is now one of the poorest. Basic supplies and food are scarce and, as well as an exodus of talent, there is a growing refugee crisis as people try to escape to neighbouring countries such as Colombia and Brazil. According to a recent paper from Brookings, there are already more than 3m Venezuelans living outside the country, including a million in Colombia. The exodus includes the desperately poor but also skilled workers and technicians on whom the economy depends. Within that group are many of those who built the state oil company PDVSA but are fleeing the corruption and mismanagement that now dominates the company. What is left of the economy only keeps going as a result of loans from Russia, in return for which Moscow is being allowed to establish a military base in the country and cash-for-oil deals with the Chinese. Under the leadership of President Hugo Chávez and President Nicolás Maduro, the accumulation of power in the executive branch and erosion of human rights guarantees have enabled the government to intimidate, censor, and punish its critics. Severe shortages of medicines, medical supplies, and food have intensified since 2014, and weak government responses have undermined Venezuelans’ rights to health and food. Security forces have arbitrarily detained and tortured protesters, and raids in low-income communities have led to widespread allegations of abuse. Other persistent concerns include poor prison conditions and impunity for human rights abuses. Another regime is also in crisis, and using repression to crush dissent, Nicaragua. There is a pressing need for the international community to recognize the right to defend rights and to provide a safe space for defenders to do their work. On Wednesday December 12 the National Assembly of Nicaragua voted to cancel the legal registration of Centro Nicaraguense de Derechos Humanos (CENIDH). After the announcement Vilma Nuñez, 80 years old, the president of CENIDH and one of the most recognized human rights defenders in the region declared “We have done our work with conviction and we will continue doing it until Nicaragua is really free”. Just a week earlier I met Doña Vilma, as she is known, in Washington DC when she came with a delegation of human rights organizations from Nicaragua to participate in a hearing before the Inter-American Commission on Human Rights and present their testimony about the continuous repression in the country. Her strength and commitment to the protection of civic freedoms in her country are remarkable. However, her voice had a sadness tint when talking on how the situation continues to deteriorate in Nicaragua. During the hearing the activists from Nicaragua provided updated information to the Commission on how the human rights crisis in Nicaragua has evolved and the serious consequences for people in the country. The organizations denounced how the State of Nicaragua continues to discourage and punish social protest and political dissent, despite the incessant calls to terminate the violence. The threats to civic space in Nicaragua are not new. Civil society in the country has been facing growing restrictions as political power has increasingly concentrated in recent years and civic space has become completely repressed. However, the situation has worsened since April 2018 when proposed regressive changes to the social security system sparked widespread, mass protests across the country. The government violently repressed the demonstrations. Since that more than 300 people have been killed and more than 600 remain in detention. Abuses and violations to civic space in Nicaragua vary from violent repression of social protest, violence against journalists and censorship of the media, and arrest and criminalization of activists to the introduction of restrictions to civic space through the legislative framework. Despite these developments, as clear as a pikestaff, many on the British left continue to support these regimes. It is time for solidarity with those oppressed by the regimes of Venezuela and Nicaragua. The civil unrest and police violence that swept across Nicaragua earlier this year leaving over 300 people dead have been followed by a wave of state repression against human rights organisations and media outlets. Most shocking among these are the police raids on CENIDH, the Nicaraguan Centre for Human Rights, whose director is Vilma Núñez. According to Amnesty International, most of the victims in the recent unrest were killed “at the hands of state agents.” Yet what happened is talked about in Nicaragua Solidarity circles abroad as if it were an internationally orchestrated coup against Ortega, thus justifying the brutality of the regime‘s response. The irony is that, as the Trump Administration ratchets up the rhetoric against Nicaragua, it is the self-serving actions of Ortega himself that leave the Nicaraguan Revolution less able to defend itself. Some on the left understand this. Noam Chomsky has called for early elections. Pablo Iglesias of Podemos in Spain, and former Uruguayan President José Mujica have also been sharply critical of Ortega. None of these individuals are in the business of promoting US government interests. Rather, they understand that defending the gains of the Nicaraguan Revolution requires the orderly exit of the corrupt dynasty that has betrayed it. Others on the left should now speak up for the basic rights of Nicaraguans as a matter or urgency. Tagged with Imperialism, Labour Party, Nicaragua, Venezuela. The Armistice and the Literature of the Great War. Both of my grandfathers fought in the Great War. My English forebear was, like his brothers, a socialist and a Clarion cyclist. Perhaps inspired by Robert Blatchford’s patriotic seizure at the outbreak of hostilities, Alfred, after a few pints with his friends, walking from Bethnal Green to the City, signed up. My Scottish ancestor, James, was also a socialist. Less taken by the fight against the Boche and a member of the ILP, which had a strong anti-war sentiments, he was swept up by conscription. I properly got know Alfred when, retired from his work in the Print, and very elderly, he and his wife moved to Bounds Green in North London. He talked of Dickens (I have his complete set) and his Labour beliefs, but never spoke about his war. My mother told me that he had been so desperate in the trenches that had tried to nerve himself up to shoot himself in the foot to get out as wounded. He told her that the officers had been brave, helped by spirits. My grandmother’s first husband, of Huguenot descent like her, had been killed. Left with a small child she got no support from his family. Alfred took to her. They married and had two other children. Neither of my grandparents ever wore a Poppy. The East Ender said once a few words, not complimentary, about the British Legion who produce them. They did not need to display one; my parents never had one: I do not need to wear one. Some of the books and poems that we read about the Great War stay in our hearts. Sassoon’s lines in Memoirs of a Fox Hunting Man (1928) “And here I was, with my knobkerrie in my hand, staring across at the enemy I’d never seen.” The words of An Irish Airman Foresees his Death (1919) “my country is Kiltartan Cross, My countrymen Kiltartan’s poor, No likely end could bring them loss, Or leave them happier than before.” (W.B. Yeats). And the immortal, “The Old Lie: dulce et decorum est, pro patria mori. (posthumously published in 1920, Wilfred Owen). The chapters in Robert Graves’ Goodbye to All That (1929) on his harrowing service in the first wave of the Somme offensive, holds a special place in the literature. He captures “feeling “empty and lost” amongst the slaughter, death sentences for “cowardice”, army pettiness and incompetence, alongside the soldiers’ good sense and humour. Wounded in the cemetery at Bazentin-le-petit church on 20 July 1916 These experience is complemented by the memorable pages of Vera Brittain’s Testament of Youth on her work as a nurse in the Voluntary Aid Detachment, which took her to london, Malta and France. The most obvious difference with literature in French and German is that authors from these countries were writing about battles taking place on their own landscape. Barbusse’s, vivid, trench language-filled, Le Feu: journal d’une escouade, 1916 is blood and fury. Babusse added sonorous appeals against national hatred . With its passion it stands head and soldiers over the to-be-Panthonised, Maurice Genevoix’s Ceux de 14, photographic realism, gutted of politics. Ernst Jünger’s Stahlgewittern (Storm of Steel) is technically one of the finest, but politically already full of the nationalism which wroke havoc in Germany. There is more common decency and humanity in writers such as Graves than anything that a cheap-jack journalist or ‘radical’ has written in the last few days. Sunday, one hopes, with see these cited amongst the witnesses of the Great War. 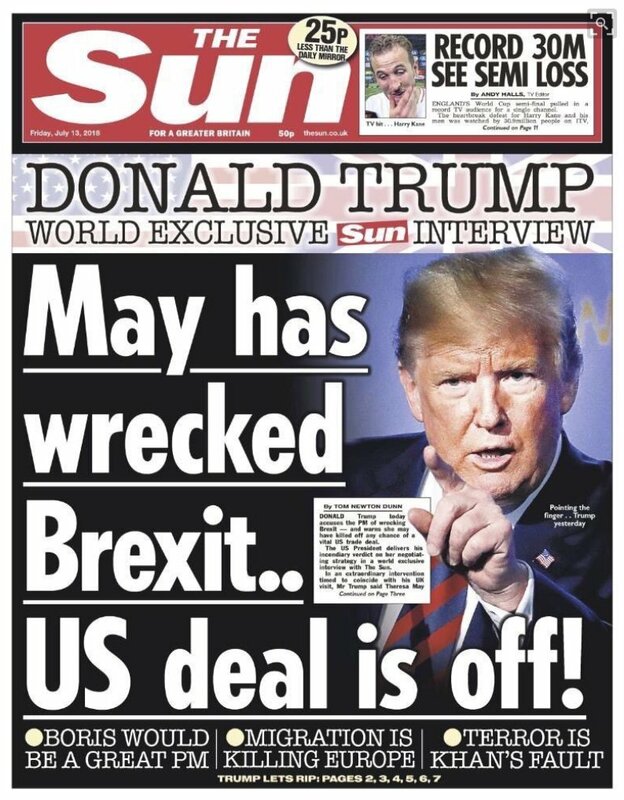 Trump Orders Change in British Brexit. Trump has not just shat on the table after a good Feed at Blenheim Palace…. Told of his pride at taking wife Melania to meet the Queen. It looks as if the present crop of British nationalists look to Trump’s America as their new Homeland. 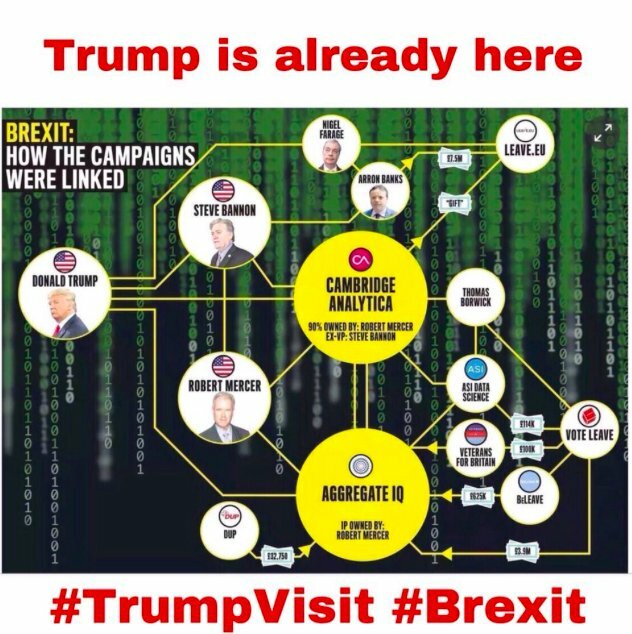 We confidently expect the keeper of the Presidential Potty, Nigel Farage, to come up with some justification for this tirade of tripe. Ipswich Together Against Trump. Friday 13th of July. 17:00–19:00. 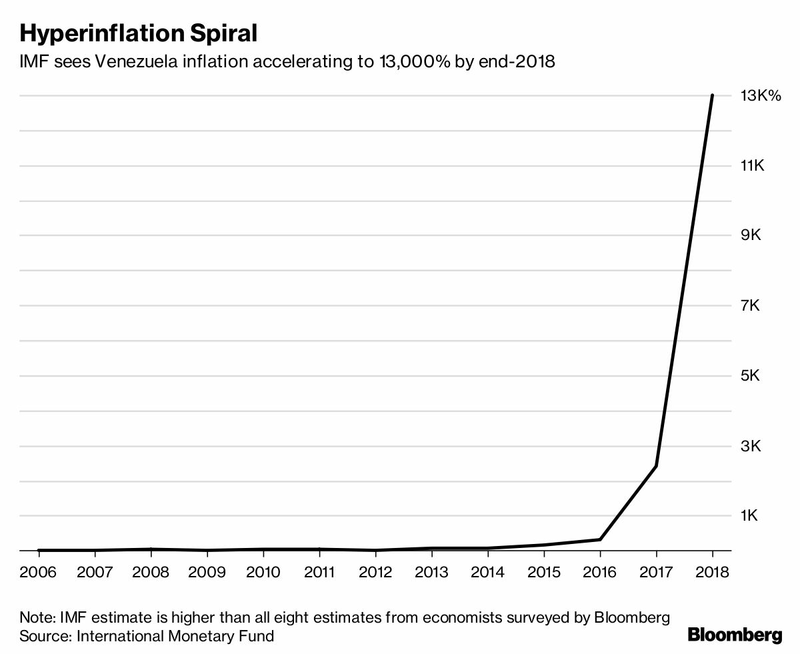 Venezuela Hyperinflation at the One Million Mark as Maduro Regime Faces Breakdown. Bloomberg. By David Papadopoulos and Fabiola Zerpa. …just two years ago, when we launched the Bloomberg Cafe Con Leche Index, a coffee cost 450 bolivars. Or that today’s price is the equivalent of almost one-fifth of the monthly minimum wage. Or that to buy a cup with the most common bill in circulation — the 100-bolivar note — you’d need to gather up a stack of 10,000 of them. Libération 22nd of June, François-Xavier Gomez. In Venezuela, the minimum wage has now been raised to 1 dollar. For the fourth time this year, President Nicolás Maduro has raised the minimum wage for Venezuelans. On the 1 st July it will pass to million bolivars, against 1 million since 1 st May To this sum is added a monthly food voucher for a value of 2.2 million bolivars. On 1 st January, the minimum wage stood at 250,000 bolivares. The inflationary spiral that is devastating the country’s economy renders any attempt at conversion useless. The government keeps the figures of the price rises hidden from its own public, while external sources (World Bank or International Monetary Fund) put them at 2,700% for 2017, with a forecast at 13,800% for this year. These incredible figures mean that a month’s minimum salary will buy you, ” deux bouteilles d’huile, ou un kilo de poulet, ou une douzaine d’œufs” two bottles of cooking oil, a kilo of chicken and a dozen eggs. More than 120,000 Venezuelans have formerly asked for asylum in Peru alone – outnumbering those fleeing to the USA, which is overwhelmed by the flood of refugees who total more than 353.000 of whom 16.000 are children. They have added to a country’s difficulties where already 60% work in the ‘informal’ economy. The Maduro ‘Bolivarian revolutionaries’ – once the best known example of ‘populism’ claiming to be on the left and a central inspiration for some European left leaders, such as the Spanish speaking Jean-luc Melechon (MÉLENCHON : “CHAVEZ, C’EST L’IDÉAL INÉPUISABLE DE L’ESPÉRANCE HUMANISTE, DE LA RÉVOLUTION“) – are trying to hold onto power through repression. El estado de derecho está “virtualmente ausente” en Venezuela. (Noticias ONU). Rule of law ‘virtually absent’ in Venezuela, UN report says. Government forces carry out killings with impunity. El País 29th of June. In the left-leaning Vice Tommy Walters reported last week on those who seek to deny these realities. Why Are People on the UK Left Supporting Venezuela’s Authoritarian Regime? Prominent Labour figures held a gathering in London to show their solidarity with a human-rights abusing government. The obvious irony of denouncing other countries’ human rights records while simultaneously ignoring the Venezuelan government’s own crimes seemed to be lost on many. It would only have taken Williamson a second to find the numerous videos and reports from international human rights organisations documenting unlawful detentions and the repression of protesters in Venezuela. As the VSC builds closer links with UK trade unions, such as Unite and the Transport Workers Federation, the Venezuelan government continues to imprison its own union leaders. Today, any remnants of the optimism of the deep social reforms of Maduro’s revolutionary predecessor Hugo Chávez are long gone, replaced by a successor who turns to violence and coercion to keep his citizens in line. Emblematic of this is the perpetual imprisonment of Leopoldo López, an opposition leader who is currently under house arrest, and has been described by Amnesty Internationalas “deprived of his freedom” in a “politically motivated attempt to silence dissent”. 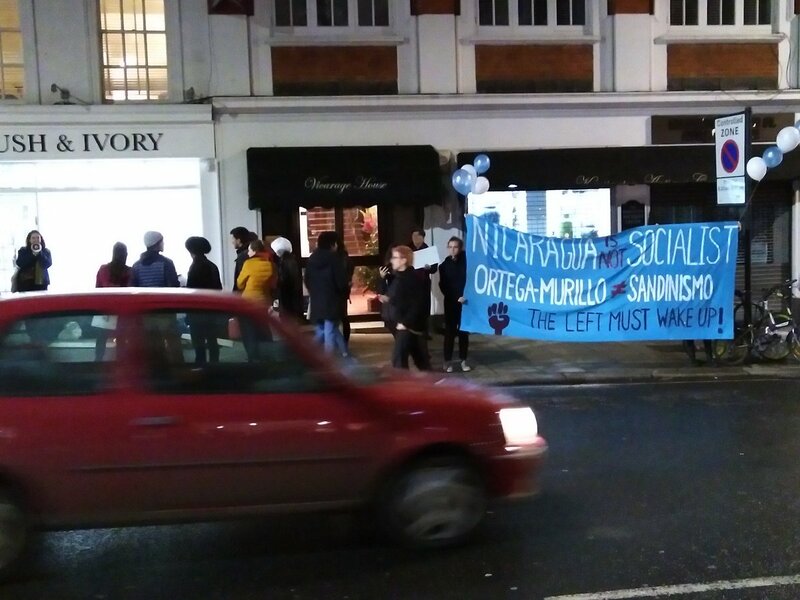 At the meeting, Amnesty International was widely discarded as being funded by “neo-liberals”, while the single mention of López dismissed him as an illegal provocateur “rightly convicted of fermenting street violence”. To explain the dismal economic performance, the VSC blamed US imperialism, while ignoring the role of Chavez’s years of high borrowing and over-reliance on oil revenues. The Venezuelan economy had been contracting for four years before Trump imposed sanctions last year. True to form the last few days have seen the Morning Star has rushed to defend the predatory clique running Venezuela in the name of ‘socialism’. Calling the above an “episode in red-baiting” the author flays around trying to find the cause of the economic difficulties of the country in the policies and actions of the comprador clique that’s taken over the mantle of left populism. The fact that the price of oil crashed almost overnight in the first year of Nicolas Maduro’s presidency is ignored. The crippling sanctions are ignored. The siphoning of essential goods across the border by Colombian paramilitaries is ignored. The distorting effects of currency speculation by international finance are ignored. The economic impact of the wave of opposition riots, vandalism and blockades is ignored. Maduro must have the healing powers of a living saint to keep people in monthly eggs and cooking oil, with a bit of poultry, in these conditions and after all these attacks! With an airy wave of the calloused toiler’s hand Vargas dismisses reports (by the UN amongst others) about repression. Chavez represented the first successful defeat of the “end of history” and US triumphalism. In those times of defeat for the left, Chavez built an economy that provided both significant GDP growth together with equality. 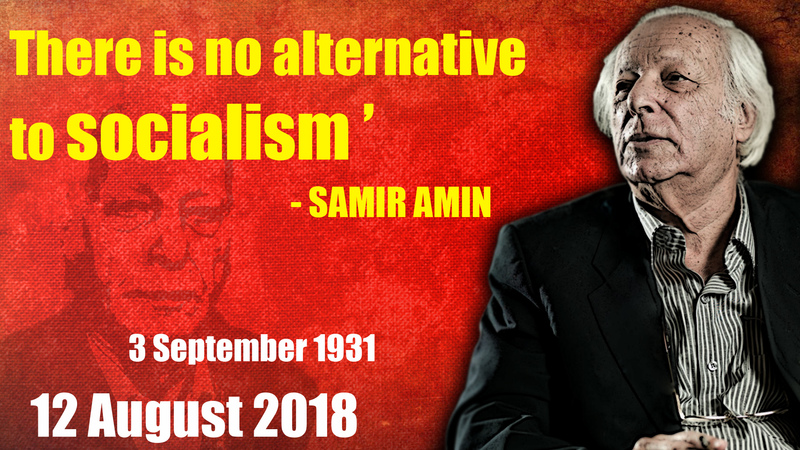 He combined that with a thoroughly internationalist outlook that encouraged social movements around the world. The huge changes in the country together with popular mobilisation mean that those who had been excluded from politics for 500 years were finally able to take leadership of their own country for the first time. Maduro is the continuation of that legacy, though with an incredibly difficult external situation as the key factor separating them. For all these reasons, I expect Chavez will pass into popular folklore as Che Guevara has done. Western writers may oppose that and the movement he represents but if they’re to write on it then it is incumbent on them to at least try to objectively understand why Maduro and the Bolivarian revolution still have the energetic support of the poor majority in Venezuela. Tagged with Anti-Imperialism of Fools, Imperialism, Venezuela. Toff Priyamvada Gopal Throws a Wobbly Over Uppity King’s College Porters. ‘Madam’ ne sied pas à son altesse, Dr Gopal. Priyamvada Gopal is a person with a bit of a history. Support for gender segregation in 2013, See, Gender Segregation and the Postmodern Politics of Despair. Attack on Mary Beard earlier this year: Oxfam scandal sparks Twitter row between Cambridge academics. Her latest escapade was not in long in getting into the media. The Cambridge academic Priyamvada Gopal announced today that she will refuse to supervise any students at Kings’ College, due to what she described as “consistently racist profiling and aggression by Porters”. This is apparently the substance of her charges. Gopal apologised to students but pointed to similar testimonies from other members of the university from ethnic minorities. She said that a King’s student told her that “the issue of racial profiling and unconscious bias at the King’s gate is something we are aware of”. The response from King’s College Visitor Service was described by the academic as a “classic nopology” – the head of the department stated “it has not been my experience”, according to Gopal. The professor, who came to Cambridge in 2001, has been involved in several public controversies in recent months, including an argument with Mary Beard over the Oxfam scandal and a Daily Mail article depicting her as a “hate-filled don”. She has also been an active user of Twitter as a platform for defending her beliefs, having 18,000 followers. In March, however, she announced she would tweet less as she feared “turning into an anti-troll”. King’s College have said the following: “We have investigated the incident and found no wrongdoing on the part of our staff. “Every visitor was asked to show their card during the course of that day, as the College was closed to everyone except King’s members. “This was a matter of procedure, not discrimination. You, madam, are an entitled snob. Some might observe that Madam Gopal is the embodiment of conservative upper-class entitlement masquerading as the fight against oppression.